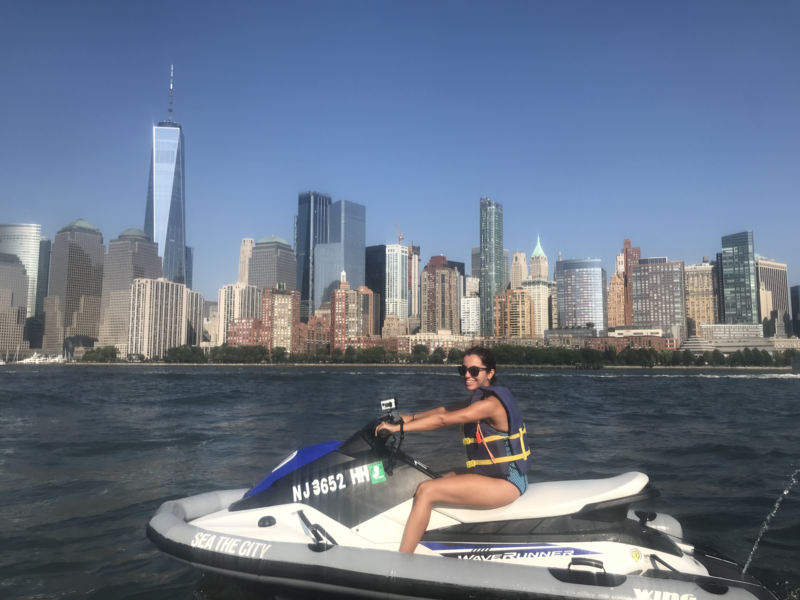 – So first of all, is jetski safe, should I jet ski in New York harbor? Duh, yes!!! If you’re like my mom, who’d get scared so much, then you can always go so slow… and again, if you’re like my mom, you’d be scared left behind the group, and then come on, it’s okay to be scared 🙂 There is nothing wrong being scared. Be a strong-minded beauty, and go ride it with your fears. 🙂 Jet ski, is an action activity, I’m sure some would call it extreme sports. If it sounds exciting to you, then you should do it. – Seriously babe, is it safe to jet ski? Yes, it is safe with a guide. They give you mandatory life vests, and wetsuits if you want. The rest is just to play with it and experiment it. – What if I fall to the water? Hmm.. Okay, you sound a bit too scared. This activity may not be a great one for you. But, there is a guide who says if you fall, they will help, and you should be getting on the jetski from the back. They will give a whole safety class, that I didn’t listen so much, but asked all my questions in the end. – Can I bring my camera or phone with me? Is it easy to take photos while jetskiing? Bring your phone with you, but make sure it’s in a case. Why? The jetskis have big waterproof compartments, you can fit water, phone, camera. But the problem is they may move around, bounce and jump. To not damage then make sure they are in a case or covered by a fabric. There will be time to take photos. The guide, regardless you pay for the photo package or not takes photos of everyone. And there you can take photos of each other as well. OR selfies. All quickly. While riding it, I don’t suggest, very hard. Remember you’re fast, and balance gets harder, you can easily drop your phone or camera. So Wait for the photo stops. – How did you record a video on the jet ski? 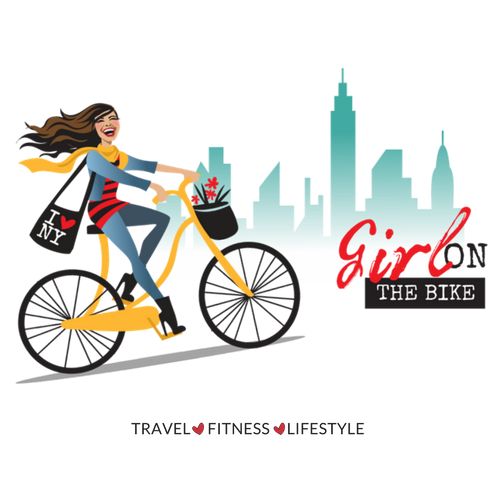 I have my amazing setup for the bike handles or baskets. And I simply used the same camera mount on the jetski. Initially, I started going fast and slowed down to see if the handle was staying still. And yes, it did, but it made me a bit distracted. 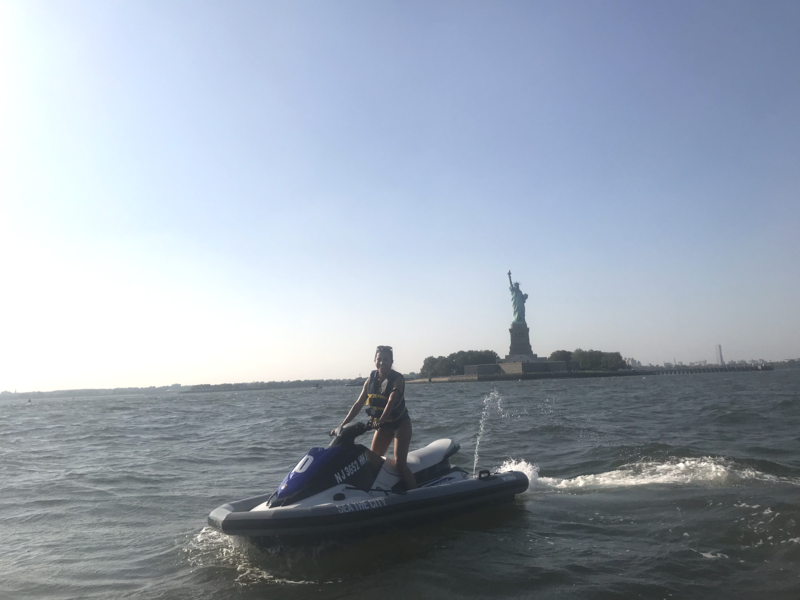 Also, I was changing the angle, so you’d see the whole jet ski in Manhattan experience from different angles. 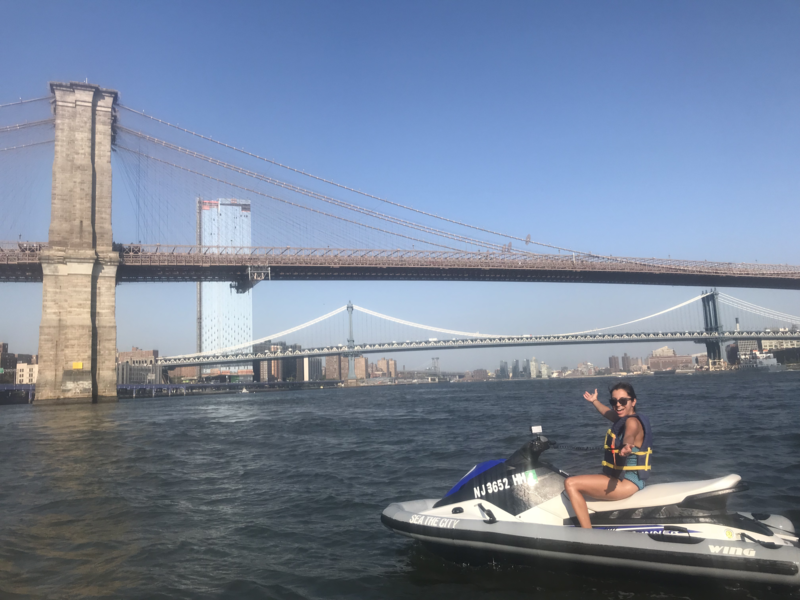 – What times are the best to do jet ski in New York harbor? – In the video, you look scared Nesli. Will you do it again? Haha. I was terrified. My heartbeats were loud as much as my screams. Don’t think it’s because it’s dangerous… it’s something like when I have an important ping-pong match, and I can’t talk and get in the zone, super stressed, the heart is pumping like I’m in a danger. But in reality, there is no danger. The same thing happened with the jetski, I was terrified. I am looking forward to doing it again, to see if I’ll get the same rush and adrenaline again. Loved it. 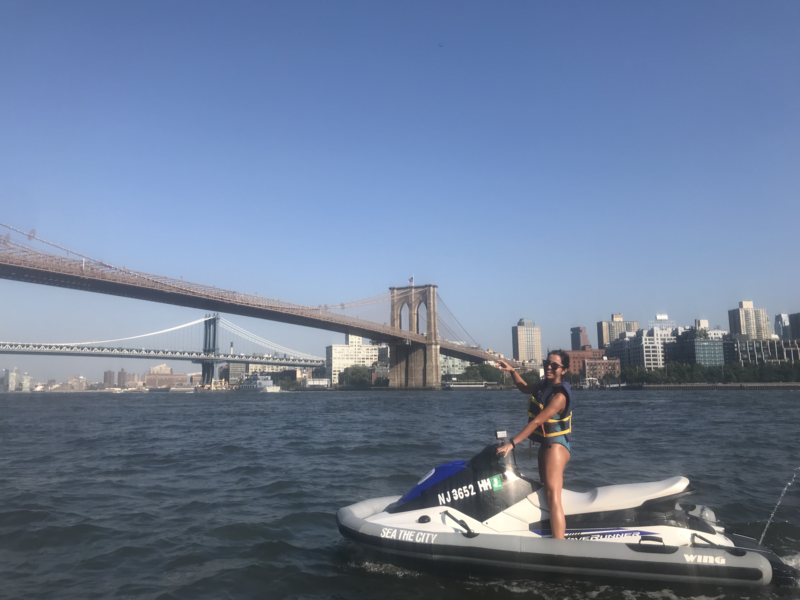 – It’s my birthday or bachelor party, or my first time in New York, do you suggest jetski? – How about sitting on someone’s back?